The former world No 1 from Pontefract had already pulled a memorable display out of the bag to defeat world No 3 Omar Mosaad in the first round and had to call upon all his experience and energy to progress further after a 70-minute encounter with world No 20 Mohamed Abouelghar. “That was an hour and a bit of frantic intensity,” said Willstrop. “Hats off to him, he made me work so hard. “I couldn’t get the ball off his racket in the middle area and he was playing excellent shots across me and that got me on edge. I had to play very, very well to beat him. 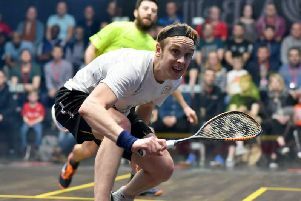 Willstrop will now go up against South African Stephen Coppinger for a place in the semi-finals after he came out on top in his second round match with Malaysian qualifier Nafiizwan Adnan. Elsewhere, Harrogate’s Chris Simpson pushed world No 1 and top seed Mohamed Elshorbagy close before losing out 10-12, 11-9, 12-10, 11-5 after just over an hour of frenetic play. Sheffield’s Nick Matthew - seeded fourth - will take on Germany’s Simon Rosner on Tuesday night.